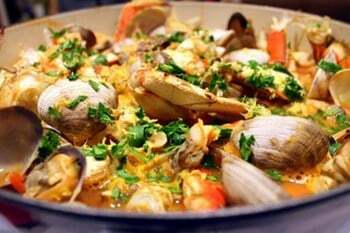 Cioppino is a fisherman stew well known in the Pacific Northwest. And with crabbing season underway, a timely, seasonal meal. It’s regional, it’s delicious and incredibly easy to make. Remove the legs and claws from the crabs and break the body in half. Clean bodies off. Place the clams in a pan, add 1 cup of wine, and steam, covered, over medium heat for 5 minutes or until clams open. Remove clams and discard any that do not open. Strain the stock through a cheesecloth and reserve. In an 8-quart saucepan, heat the oil. Add the onion and garlic and sauté over medium heat until soft, but not browned. Add tomatoes, tomato paste, and 2 cups of water, pepper, herbs, and clam stock. Partially cover and simmer for 20 minutes. Add the clams and heat for a scant 1 minute. Sprinkle with parsley and serve immediately from the pot.